Wong Audiovisual Center (AVC) is located on the third floor of Sinclair Library, serves University of Hawai'i at Mānoa students, faculty and staff, other University of Hawai'i colleges, visiting scholars, and visitors from the community. It contains video and audio media including a large number of feature films in English and other languages. Course Reserves are also housed here. Dedicated on January 23, 1987, the Harry C. & Nee-Chang Wong AVC was made possible through a generous gift from the Harry C. & Nee-Chang Wong Foundation. The continued generosity of the Wong Foundation has made it possible for Wong AVC to keep up with technological developments in the area of media and to provide resources and equipment for student, faculty, and staff use. One of the best moving images collections on Hawai'i and the Pacific Islands. Pays special attention to acquiring, reformatting and preserving materials. Regularly tapes off-air and preserves most locally produced programs on Hawai'i. Other outstanding collections include those on Asian Americans, Asia, Art, Architecture and the Performing Arts. The Wong AVC staff endeavors to provide an excellent level of service to honor our continuing relationship with the Wong Family. Most media can have holds placed on it through the Hawaii Voyager catalog. Loans: Most audiovisual media may be borrowed by University of Hawaii system with a UH ID for 7 days. See information on loans for Community users. Borrowing Limits: There are limits on the number of MEDIA items (CD, DVD, Videotape, etc.) that a patron may check out at one time. Community Users and Associate Users -- Limited to 1 item (in-library use only). See Community Borrower policy. Materials may be renewed at a UH Library circulation counter or on-line via Hawaii Voyager. Media may be renewed from the due date for 7 additional days unless the item is reserved or booked for a class. Exceptions are reference titles, items that are reference in nature, and items that are restricted by copyright. Renewals will not be accepted via telephone, fax or e-mail. Materials can be returned to any UH System library. When the library is closed, materials should be returned to the media/book drops located next to the front doors of Sinclair Library. "The mission of Hōkūle‘a’s Worldwide Voyage is to navigate toward a healthy and sustainable future for ourselves, our home – the Hawaiian Islands – and our Island Earth through voyaging and new ways of learning. Our core message is to mālama (care for) Island Earth – our natural environment, children and all humankind. In early May 2014, the two wa‘a kaulua will sail toTahiti, the first international leg of the Worldwide Voyage." "News clips and documentary footage combine in this special about Nainoa Thompson, the master navigator, and his historic voyage from Hawaiʻi to Rapa Nui aboard the Polynesian voyaging canoe Hōkūleʻa. Thompson expresses his feelings about sailing, his hopes for the voyage and the future. Rapa Nui residents tell how they feel the voyage will impact their culture which, in the midst of change, is being threatened and diluted. Examines the huge Moai figures found all over Rapa Nui. Shows the welcoming celebrations that took place when Thompson and his crew successfully completed their journey." "Assesses the cultural significance of the Hokuleʻa project and its impact on the Hawaiians. Includes coverage of the homecoming in 1987, the summer sail program of the Dept. of Education, and interviews with members of the crews and others associated with the project from the start to the present." 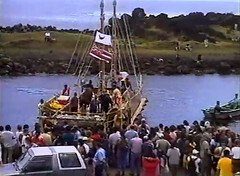 "Scott Sullivan, a crew member on the Hōkūleā on its Voyage of Rediscovery in 1985-1987 explains what it was like to be on this historic voyage. He reviews the construction of the canoe, the ancient Polynesian navigation techniques used on the voyage, who were the crew members and how they were selected, and the data generated by the trip for the benefit of science and culture. The canoe visited many islands of Polynesia including New Zealand, Tonga, Samoa, the Cook Islands, and Tahiti." Also, fines for overdue items are assessed every day (hourly for Reserve Book Room items) including weekends and holidays. An item will be deemed lost when the fine reaches $10.00 (10 days after the due date for items at $1.00 per day; 20 days after the due date for items at $.50 per day; 40 days after the due date for items at $.25 per day). Lost charges include the replacement cost of the item, a $10 NON-REFUNDABLE processing fee, in addition to accumulated overdue fines. Borrowing privileges will cease if financial obligations owed to the library total $10 or more.